This is a very important video, but you may have been tempted to skip over it, and maybe at this point that makes sense because you haven't really delved into the GRE very much, but there's gonna come a point, and it may come very soon, when your patience is tested, where you just want to throw up your arms and say okay enough, I hate this expletive test, and you wanna give up for that moment, and that's really what this video is for is getting you through those moments, now my hope is that we have an excellent that allows for as few of those flustered moments as possible, nonetheless you're still gonna need a lot of patience when you're doing GRE prep. And it's not just because maybe you haven't seen math in ten, fifteen years, or vocabulary words scare you. Or maybe even English isn't your first language. It's the fact that you're going to put a lot of effort and a lot of time and you're not necessarily going to see the results right away and of course, nobody wants that. You know, but say you want to get into good shape, you want to have big muscles or be really lean, the last thing you want is someone to tell you to is well you have to follow my workout but you're not going to see results up first and you'll say, oh I want the quick fix. The GRE there really is no quick fix. It'll take a lot of patience, and what you're going to notice is that you will finally improve but it's going to be more of this plateauing. and what I mean by that is you start out here, and the higher up you go the higher your score. First you're going to get a little bump. Your brain gets a little bit of exposure to the GRE and you're feeling good but then you kind of hit this wall and there's that plateau, and I'm by the way a horrible artist, that's probably the worst straight line in history, but there we go. Somewhat better. What this means is, this here, this axis is time you've gone on for a while, a week two, weeks not improving, and it's at this point that you're gonna need patience. Because you will suddenly improve, you're gonna go up a little bit, a few points in math a few points in verbal, you're gonna get bet better. But it's gonna be a process like this plateauing, unfortunately it's not a whoop! line, everyone would do well on the GRE. Now, something else, when it comes not necessarily in patience, but I guess it does tie into patience a little bit - something a little more subtle. And it's the idea of learning from your mistakes. And of course that almost sounds cliche. Oh, yeah, learn from your mistakes. Do better next time. But in this GRE context, in the test prep context, learning from your mistakes is a lot more nuanced than that. And what I mean is, when you get flustered, when you can't solve a problem, the first thing you want to do is you want to look at the answer. You wanna think "okay well what's the answer say? ", and often times the answer is very illuminating. Hopefully our video explanations in every case help you arrive at the correct answer. But the idea is are you going to be able to avoid that same mistake in the future just because we gave you an explanation? Explanation, now hopefully the explanation helped but at the same time though when you make a mistake you should try to figure out what you did wrong, you should really dissect your thought process so that you can next time say "Aha! I'm going to do this instead of what I did the first time around." Now, part of this learning from mistakes is this idea of confusion. And of course, we all have confusion on the GRE or any standardized test but the idea of confusion here is when you get to a certain point in a hard problem, maybe it's thirty seconds, may be it's about a minute but at this point feeling flustered, feeling confused, and you want to give up. Starting off, it's very important for you not to give up, not even to worry so much about the time, and I know it can be very stressful with Magoosh because we have these questions with the timer counting down, but you can hide that timer. You can allow yourself to delve into the problem and understand what's going on so this confusion isn't a bad thing. It's just an opportunity for you to figure out what this problem's about, to think at it at a deeper level, to try many possibilities for instance in math if you're not sure how to get to the answer try a few things experiment This is when this confusion rears its ugly head, its if you stop and give up that's the problem, that's when we come back to Patience, and it's working through that confusion that finding that answer that's really going to help you improve and even if you don't get the right answer going back and learning from your mistakes is going to be very helpful for this process. So if you're watching this video now and you're gonna go and do all these GRE questions on Magoosh and have yet to do so. Remember this video, maybe a month down the road, maybe even before you take the test. I would definitely encourage you to come back here and see see what or see how these apply to your GRE journey the point where you're at now I'm sure at least one of these will that's a good idea to come back here of course and apply this video to the difficulty that you're having with the GRE, and again, it's almost inevitable, I don't want to say oh yeah just watch all these videos, everything will become really easy and you'll get a perfect score. No, not at all. 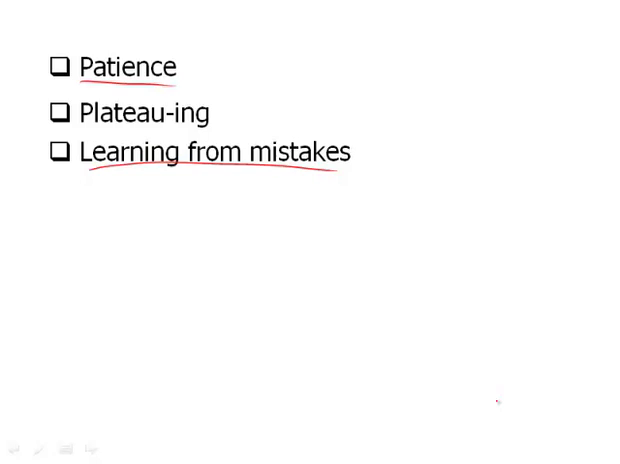 Again, it's patience, there's gonna be plateauing, that means you'll increase a little bit but it'll take a while for you to hit the next plateau. Okay, Now as far as, kinda, test management goes, and its the whole psychological component, there's a really big thing I'm missing out. I mean totally remiss. If forgot to talk about managing stress the day of the test. Test date during the actual test this is what it's really all about. You can have the upmost patience as you go through the preparation of the test. You can work for three or four months and be really ready and then you get to the test and stress unravels you and I've talked to many people, had many students over the years for who this is a problem. So, what can you do? Well a few things, first off, breathe. It seems like the most simple thing possible to imagine but it can really help. Because what's going to happen is you're going to feel a knot in your stomach just as if you were about to go onstage and talk to two thousand people those same butterflies, that same knot it's going to be there. If you breathe from your stomach below down deep. Not so much from your chest and lifting up your shoulders this is going to help stabilize the natural panic response you're going to have testing. Trust me it is inevitable, the panic response will rear it's ugly head, so definitely breathe. We'll learn how to breath and in essence prepare yourself for battle. by doing mock tests. Can't recommend this enough. Mock tests are something you can take on our website we have Magoosh mock tests you can take. The mock test that ETS provides, those are the people who actually write the GRE. And so this is great because you're gonna notice your pulse quickening, you're gonna feel flustered, you're gonna wanna run or leave wherever it is you're taking the test. But the idea is if you can learn these coping mechanisms during the mock test, it will better prepare you for testing. So that's it as far as stress goes and psychological component but I don't want to underestimate this. This is a big part of doing well, is not just the discipline not just following the Magoosh videos and learning, but really that patience and if that voice, that doubtful voice --I should probably mention the doubtful voice-- says, oh I can't do it. Any point, at any point whether its right after you Watch these videos and try a few questions. Or it's actually testing itself, oh I'm not good at this. Learn to ignore that voice. Think in terms of what have you learned about the technique. What have you learned about the concepts? What have you learned about pacing? Should you be doing a really difficult question? Maybe not, the doubtful voices just saying I'm not good at it, well you're actually doing one of the most difficult questions, skip it. Each question is worth the same. Again, we're learning to cope, deal with these issues before the test during mock test is your best way to prepare for test day.